Created by Jane from See Jane Blog. Edited by Amy Christie. The holiday madness is upon us. Are you ready? This year I decorated the house with a mix of textures: sparkle and shine along with cozy and natural. 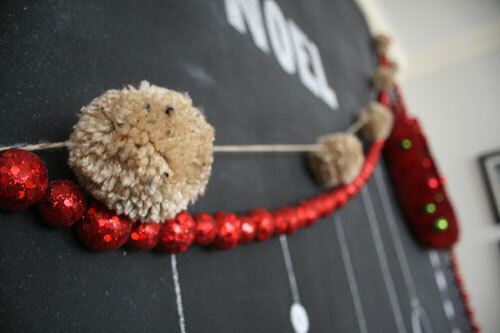 For the cozy and natural, I whipped up a pom pom garland using the same pom poms in these adorable bookmarks. While browsing the yarn section at the craft store I fell in love with this tan/grey/earthy mix. It just screamed ‘use me!’ and I couldn’t resist. This has been the perfect compliment to the other items I’m using to decorate. So, if you have a fireplace (or wish you did! ), choose some yarn, get cozy by the fire, and enjoy this simple craft. Let’s make the pom poms first, eight of them. Start by holding the end of the yarn in your hand. 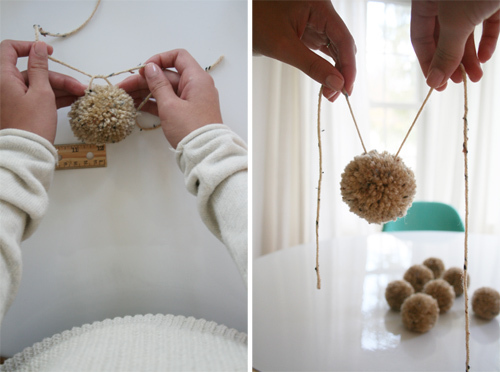 For this size of yarn ball, wrap the yarn around all four fingers. I suggest you wrap the yarn at least 90 times though you could do as many as 120 wraps or more for this larger pom pom size. Slide the yarn off your fingers, and place it over a strip of yarn cut 8 inches long. 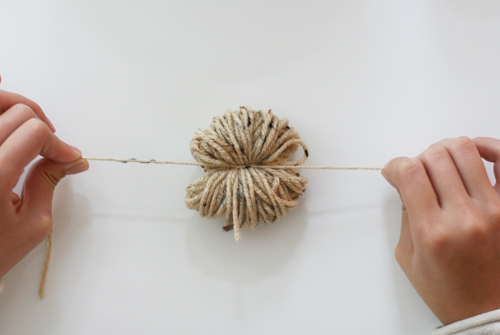 Tie the string of yarn around the mound, and into a knot. Next, slide the scissors through the yarn, and snip all the loops of yarn, all the way around and ta-da! 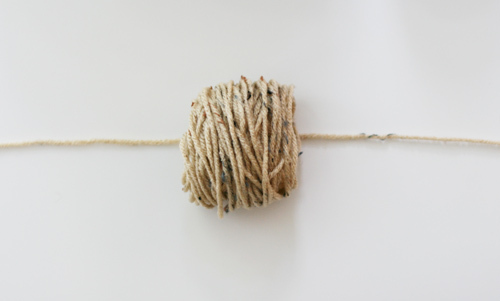 A messy yarn ball. It needs a haircut, so start snipping the ball into a nice round shape. After the haircut, your yarn balls should look like this. 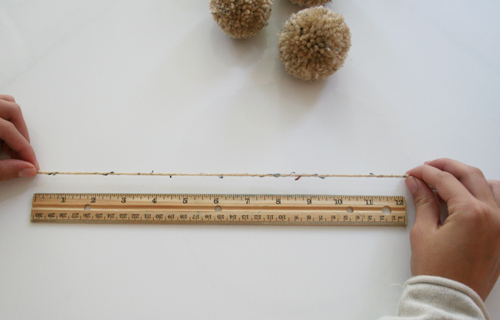 Next, to create the garland, measure 94″ length of yarn. From the beginning of the yarn, measure 12″ and leave this for the end. It’s at this spot where you also tie on your first yarn ball. 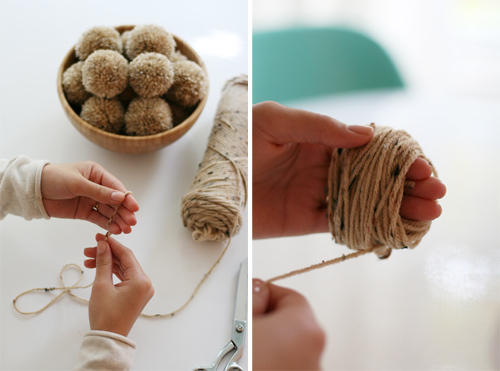 Simply tie the yarn around the yarn ball in this spot, and into a knot. 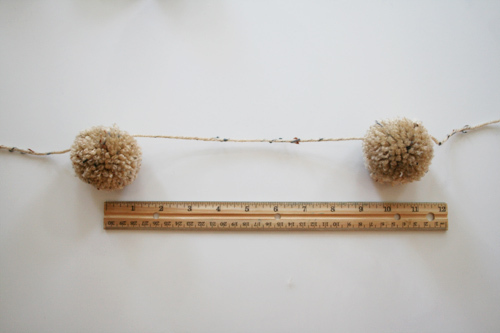 After the first yarn ball, measure and tie–on another yarn ball every ten inches. Repeat until all eight yarn balls have been tied on. There should be 12 inches for a tail at the end. Then hang and enjoy! Have a cozy holiday season, friends! P.S. — This garland would be adorable in bright colors too. Those are adorable. 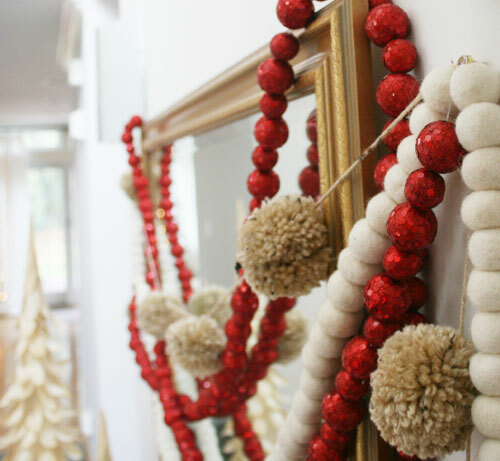 I haven’t made pompoms in years, but I just might have to break out the wool to give one of these garlands a try. I saw a similar one in the Anthropologie store and am making my own already! Very cute project. You’re reading my mind … I just got the yarn out to make some pom poms … guess I’ll be making some more now. Seriously so cute!! I can’t wait to make some!!! And thank you for making a tutorial that is simple! Love! And btw I think yours is cuter than the Anthro one! Just sayin! thank you, you are so sweet! xo. This is awesome! We aren’t planning to unpack all of our Christmas decorations this year since we are moving into our new house either right before or right after the holidays but we still have to put up a tree for the girls so I’m planning to doll it up with some easy crafts (which would serve the double purpose of keeping all of our hands busy with something other than remodeling projects). This garland is definitely on the list! Adorable! I could put poms poms everywhere, curtains, pillows, lamps if I was not afraid of being ridiculous. 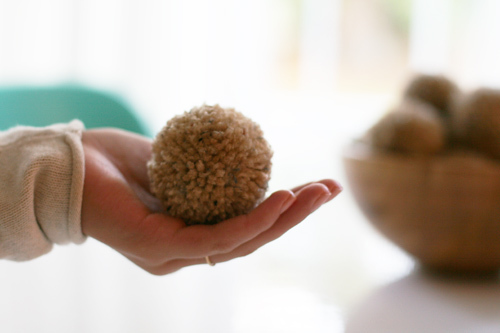 Love your pom pom balls! I will have to try this craft — it’s so simple and sweet. This is wonderful! I have a sparse little tree this year that has been needin’ some lovin’. The bulk of pom poms would give the tree the extra oomph I have been searching for. Thank you so much! I love pom-poms! Soo cute and fun! 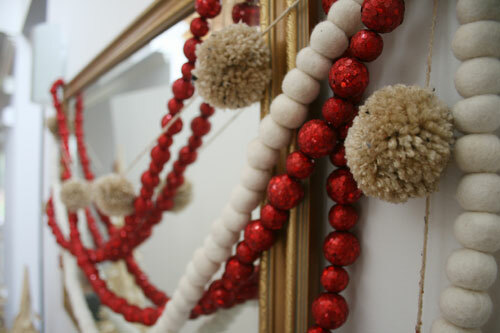 Any ideas on the source of the glittery-red ball garland?? hey Danielle – I found the glittery-red-ball garland at Target last year, maybe they will have something similar this year?!? wow. That’s a nice Christmas project. Love that colors combination! Very cute! I made your yarn ball bookmarks and had so much fun. I’ll definitely copy this one, too! I love these simple crafts! Do you recommend a certain type/quality of yarn to do these? My first attempt does not look quite as fabulous as yours! Does it need a better haircut or better yarn to get that fluffy round shape? hey Mickisha, it takes a little practice. I use every type of yarn – the type should not matter. 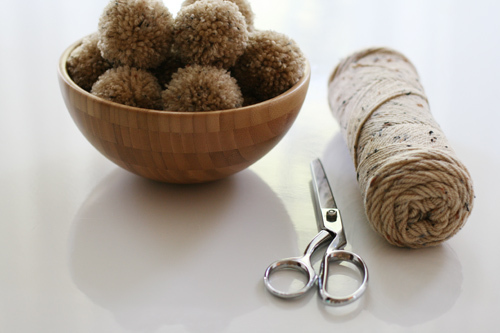 Try wrapping the yarn around your fingers MORE times, and make the haircut a bit tighter. eventually, you’ll get it! happy crafting! Thank you for this! I’m going to make these for a baby shower I am hosting this weekend, and I am hoping the mom-t0-be will reuse them for the baby’s nursery! So cute! thanks so much for sharing this, it’s made our home extra festive and fun this christmas season! I am a house wife and I often like to knit the wool in free time. Now, I will design a new sweater for my husband after visiting here. Love, love, love the pom poms! Interestingly, you used the same yarn that I have had sitting in a bag for two years with the intention of crocheting a blanket… I think maybe I can manage using it for the pom poms! Yay! whole neighborhood can be thankful to you. Perfection in simplicity – love the fact that the list of stuff you need consists of only 2 things, unlike with many other crafts! Really, it takes so little to make something so great!